Doctors, dentists say growth in cosmetic procedures comes from patient demand. In an era when wrinkles and imperfect teeth are quickly becoming passé, increasing numbers of doctors and dentists are jumping on the quest-for-youth bandwagon, offering patients an expanding menu of age-concealing cosmetic procedures. Going to the dentist for a routine cleaning? You’re likely to walk out with a pamphlet on tooth whitening. Seeing the dermatologist for your annual skin-cancer check? Chances are you’ll leave with brochures on Botox, microdermabrasion, wrinkle fillers and laser treatments. According to the American Society of Plastic Surgeons, cosmetic procedures have been on a steady rise since 1992, with 240,000 more minimally invasive procedures done in 2005 than 2004. The most recent ASPS data lists the top five minimally invasive procedures of 2005 as Botox, microdermabrasion, laser hair removal, injections of fillers made of hyaluronic acid (including Restylane) and chemical peels. Cosmetic procedures are generally not covered by medical or dental insurance. Nevertheless, the surge in patient demand for cosmetic work is clear – and, said Scarsdale dermatologist Dr. Amy Newburger, largely attributable to baby boomers’ resistance to growing old. Our society, she adds, also has a tendency to correlate a youthful appearance with energy and success in the workplace. Visible signs of aging – crow’s feet, lines around the mouth, discolored teeth – can be difficult to banish. Looking in the mirror and seeing an image of your mother staring back, said Newburger, can send a jolt of shock through even the most self-assured. But for those who try to turn back the clock, tools like hair dye, whitening toothpaste and wrinkle cream are sometimes not enough. “No longer can you fix one weekend’s indiscretions with a little bit of makeup,” said Newburger, vice president of the Westchester County Medical Society. As a board-certified dermatologist who’s been recognized for her research in malignant melanoma, Newburger said that at first she resisted getting involved with cosmetic work. But when patients told her they would find another doctor willing to inject collagen – or do whatever else they requested – she was prompted to help them. These days, 50 percent of her practice is devoted to cosmetic dermatology. The procedures most in demand among patients at Newburger’s six-physician practice, Dermatology Consultants of Westchester, include Botox, injections of fillers to minimize wrinkles and volume loss associated with aging, and laser- and light-based therapies. Botox, or botulinum toxin, injected to relax muscles that produce facial lines, has become increasingly popular, with TV commercials and magazine ads aimed at the age-fighting population. “No question it’s increasing patient awareness,” said Dr. Marvin Fier, a dentist with offices in Pomona and Yonkers, who lectures regularly with Dr. Bill Dorfman, the dentist of “Extreme Makeover” fame. 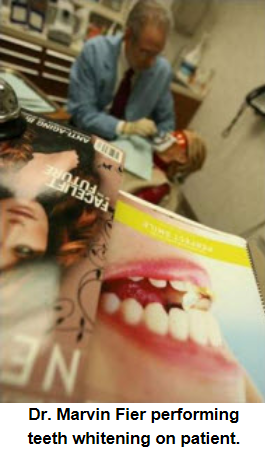 Fier, the executive vice president of the American Society for Dental Aesthetics, said cosmetic dentistry has made great strides in recent years. Various whitening methods can improve the appearance of teeth. And porcelain veneers can close gaps and straighten crooked teeth without braces. When it comes to facial surgery, some eye doctors have also expanded their menu of services to include a variety of cosmetic procedures – like Dr. James Gordon, a White Plains ophthalmologist who specializes in surgery of the eyelids and upper face, a specialty known as oculoplastic surgery. Some patients, Gordon said, ask for cosmetic procedures to enhance blepharoplasty, a surgery that removes excess skin from the eyelids. Dermatologic surgeon Rhoda Narins, president of the American Society of Dermatologic Surgery, said that injectable wrinkle fillers have come a long way in recent years. Among the cosmetic procedures offered at Narins’ two Dermatology Surgery & Laser Centers -in White Plains and Manhattan – are Botox, liposuction, hair transplantation, fat transplantation, laser treatments, chemical peels, sclerotherapy for spider veins and eyelid surgery. “It happens all the time,” said Dr. Peter Bogdan, an internist and pulmonary consultant who branched out into cosmetic work seven years ago. In his work as director of New Horizons Medical Spa in Yorktown Heights – and as the visiting physician at Epidavros spa in Mount Kisco and the medical director of the newly opened Dermacare clinic in White Plains – Bogdan sees patients who might do just as well with a facial. “I’ve had women come in and they just saw a television program and they have a little bit of extra money and they want Botox,” he said, noting that he tries to steer them away with these words: ” ‘You do not need Botox. You do not have any wrinkles at rest. And when you make a frown, you hardly have any. Why would you want Botox? You don’t need it.” Bogdan admitted, however, that at the age of 68, he got tired of looking at his jowls and submitted to a laser treatment designed to tighten up the jawline. He was stunned at the results. Fier is also a firm believer that looking good is an integral part of feeling good – and that a sparkling smile can do wonders for self-confidence. Reach Linda Lombroso at llombros@lohud.com or 914-694-5059.